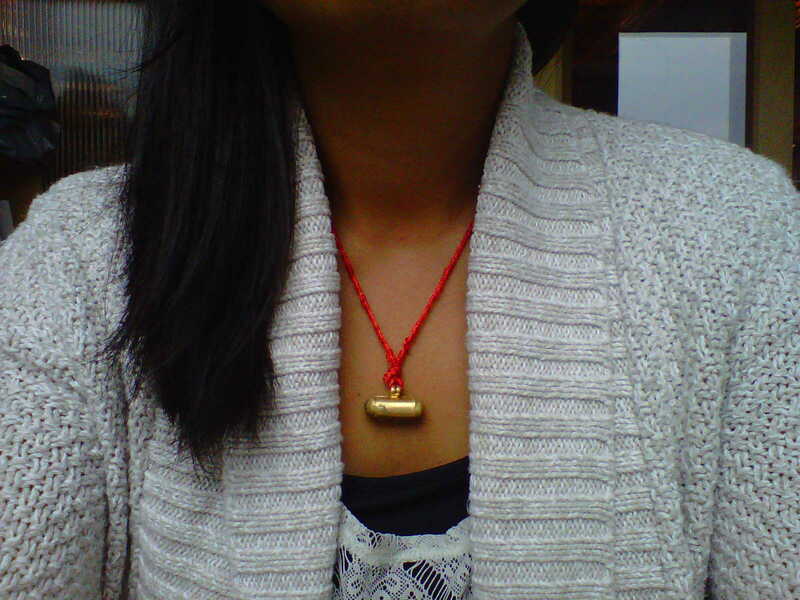 This past weekend, I went home to visit the family, and my Amala gave me this little trinket to attach to the ‘tsemdhue’ around my neck (a red string which is supposed to be a “protection and blessing cord” blessed by a lama). When I asked her what the trinket was exactly, she didn’t really know, but knew it was blessed by a lama. I remember coming across similar-looking objects twice before, but was hoping for a full Tibetan folklore-type story Amalas are known for and awesome at telling. The first time I saw one was last year when I visited India and saw my little cousin wearing one attached to a ribbon of cloth she wore across her body, like a warrior. When I asked her what it was, she said that it was there to protect her, before running off to play with the other cousins. All Chushi Gangdruk soldiers wore a “tson-sung” protective amulet. Chushi Gangdruk was an organization of Tibetan guerilla fighters who fought the Chinese military to overthrow the Chinese government and regain Tibetan independence. This guerilla movement lasted until 1974. The amulets vary in shape, size and form, but are commonly stylized metal boxes of several inches in diameter, with fancy metalwork on the outside, a glassed window for a photograph of a high lama, and an open space inside for blessed objects, prayers, precious pills, religious images, and other sacred items. Blessed objects from His Holiness the Dalai Lama were considered especially powerful. Once consecrated, Tibetans believe a tson-sung amulet will protect against the following: accidents, misfortune, illness, bad dreams, evil omens, dog bite, injury by wild animals, pollution, poison, theft, injury by lightning, failure in business, harm to the harvest, and harm by weapons. Chushi Gangdruk soldiers commonly wore their tson-sung protective amulets under their clothes, on their skin, and believed the amulets made them bullet-proof in battle. It’s believed that many Chushi Gangdruk fighters escaped death, and that bullets did not hit, penetrate or affect them as a result of wearing the tson-sung, however they did not protect the fighters from stones. It’s also believed that the success of Chushi Gangdruk’s battles was largely accredited to the amulets the fighters wore. On the battlefield, soldiers especially feared female pollution, which they believed could weaken one’s protective amulet or even eliminate its powers. While polluting substances or actions were to be avoided in general, soldiers believed polluting substances of the female body could fully cancel the power of their protective amulet. Specifically, if a bullet was dipped in women’s menstrual blood, then the protective powers of the tson-sung amulet were lost. A blood-dipped bullet would kill you. Narrative Disposession: Tibet and the Gendered Logics of Historical Possibility. Carole McGranahan. Tibet Oral History Project. Interview #13 – Ngawang Lobsang. I’m still not 100% sure whether what Amala gave me is the same type of amulet, but I don’t care what Britney says, if these are going to protect me (or at least allow me to believe I’m protected), why not! lobsang la…. thanks for sharing such information to the tibetans as well as other people. ii remember also one incident of last year during my first year college days. i met a tibetan girl in my college who spent most of life in the indian society rather in ours. she was not ready to listen at all when i shared her such unbelievable power of tsun-sung. anyway your dairy may bring, at least,some curiosity among those who do never know such hidden truth.